Drive with Horizon Freight Lines - Join our Family Today! Join our family and experience the difference today! You deserve to work with one of the best companies in the transportation industry. 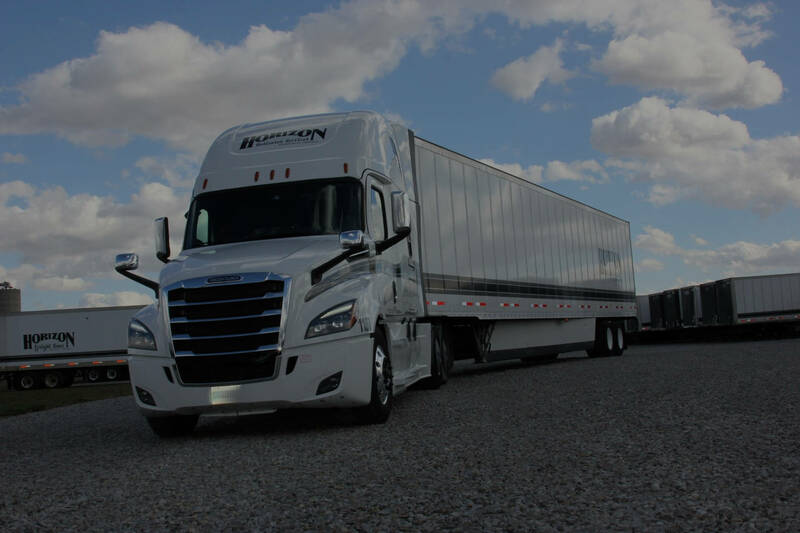 Horizon Freight Lines is a leading carrier specializing in local, short-haul and long-haul dry-van truckload service. Small enough to know you by name, large enough to keep you rolling. Why Horizon Freight Lines, Inc.? We're Honest – What We Say is What We Do! In accordance with §391.21 & .23 of the Federal Motor Carrier Safety Regulations (FMCSR), an applicant must list all previous work experience for the three (3) years prior to the date of application, as well as all commercial driving experience for seven (7) years prior to those three years, for a total of 10 years. PLEASE LIST STARTING WITH MOST RECENT EMPLOYER, EMAIL TO SATTERM@HORIZONFREIGHTLINES.COM IF ADDITIONAL SPACE IS NEEDED. * The Federal Motor Carrier Safety Regulations apply to anyone operating a motor vehicle on a highway in interstate commerce to transport passengers or property when the vehicle: 1) weighs or has GVWR of 10,001 pounds or more, 2) is designed or used to transport 9 or more passengers, or 3) is of any size and is used to transport hazardous materials in a quantity requiring placarding. Has your permit, CDL, or privilege to operate a motor vehicle ever been denied, suspended, or revoked? Please list all motor vehicle collisions in which you were involved (both commercial and private vehicle) during the past three years prior to the application date. If none, type "none." Please list all traffic convictions and/or forfeitures (both commercial and private vehicle) for the past three years (other than parking). If none, type "none." Have you received any safety awards or special training? Do you have full knowledge of the Federal Motor Carrier Safety Regulations? Have you been a driver for this company before? Have you ever been convicted for DUI, DWI, or OUI? I authorize the carrier to make such inquiries and investigations of my personal, employment, driving, financial or medical history and other related matters as may be necessary in arriving at an employment decision. (Generally, inquiries regarding medical history will be made only if and after a conditional offer of employment has been extended.) I hereby release employers, schools, health care providers and other persons from all liability in responding to inquiries and releasing information in connection with my application. In the event of employment, I understand that false or misleading information given in my application or interview(s) may result in discharge. I agree to abide by the rules and regulations of the carrier as well as the Federal Motor Carrier Safety Regulations. I also agree and understand that if I am selected to drive for the carrier that I will be on a probationary period during which time I may be discharged without recourse. This certifies that this application was completed by me, and that all entries on it and information in it are true and complete to the best of my knowledge.